NETGEAR's original battery-powered Arlo [reviewed] wireless cloud camera won a lot of fans with its small size and unique put-it-anywhere design. But its no-wires design required an expensive wireless base station and limited recording to motion-triggered events only. Enter the Arlo Q. It's still wireless for network communication, sporting a N600 class dual-band Wi-Fi radio. But Arlo Q gets its power via a cabled wall-wart supply. Gone is the proprietary base station that Arlo cameras used for wireless communication. But that's also going away for original Arlo, too, as soon as NETGEAR releases firmware announced at CES 2016 for some of its Nighthawk routers. The new Arlo Q's form factor is more Nest Cam-like vs. the little pod shape of Arlo. Arlo Q is also not weatherproof and intended for indoor use only. In a lot of ways, Arlo Q is a completely different camera. When I first hooked up the Arlo Q, I was blown away by the sharp video quality, and that comes from someone who has worked with lots of surveillance cameras. I went to grab the FCC pictures of the Arlo Q's innards, but NETGEAR's short-term confidentiality period hasn't yet expired. I didn't have the proper Torx driver to open the case either, so Arlo Q's insides will remain a secret for awhile longer. Included in the box is the camera, a window sticker so you can tell the bad guys that Arlo is watching them, a wall mount plate, 4 mounting screws and the Quick Start Guide. Arlo Q's is magnetic for easy mounting and moving. I've included the Arlo Q's specs below with specs for the original Arlo, Nest Cam and Foscam C2, which I see as Arlo Q's closest competitors. Note that I haven't reviewed the C2, although we have taken a look at the Foscam C1, a 720p version. I am basing my assumptions of the C2 being a competitor based on the findings of the C1 we reviewed. The table below shows the key information I collect for cameras; blanks mean the info wasn't available. Setting up the Arlo Q was fairly easy, although different than other cameras I've tested. The Foscam C1 and Nest Cam had a QR code on the camera that was scanned by a companion app for connection. With the Arlo Q, I entered my connection info into the app and the app then provided a QR code. From there I held my phone, with the QR code showing, in front of the camera until it connected. Since I already have an Arlo account from testing the original Arlo, the app just added the Arlo Q to my existing account. The screenshots above and below show some of the setup screens (in order, left to right). Once set up, live and recorded video can be accessed via the Arlo app on iOS, Android, FireOS or any web browser. On the cloud side, strong passwords are required. Authentication happens over an HTTPS connection and login attempts are limited to 5 attempts over 5 minutes. If you are familiar with the original Arlo, this is exactly the same, as it uses the same app. Out of the box, the Arlo Q gives you 7 days of FREE event-triggered cloud recordings, video or audio. Like its competitor Nest Aware, continuous recording can be purchased. Pricing plans for Arlo Q and Arlo are different, because Arlo can't record 24/7 without quickly draining its batteries. The image below shows the current pricing structure for the Arlo Q. How does this compare to Nest Aware? If you remember from our Nest Cam review, Nest Aware pricing gets a little convoluted, so I'll sum it up. 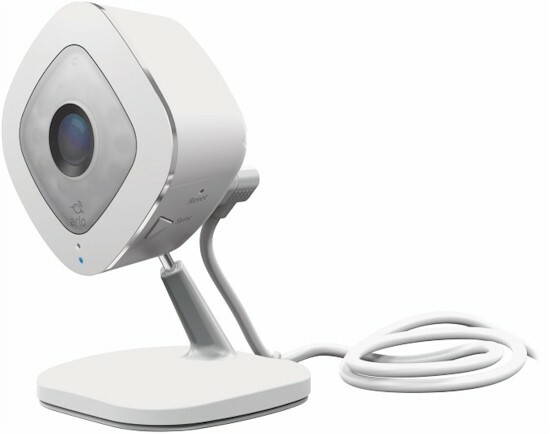 With Arlo Q, one camera and 14 days of continuous recording is $9.99 a month, with two cameras it's $14.99. The closest comparable Nest Aware plan is 10 days of comparable recording for one camera for $10 a month, and $15 a month for two. Nest Aware starts adding different prices if the cameras are in different homes, I saw no such stipulation for Arlo Q CVR, so there could be potential savings if you have more than one residence. 30 days of continuous recording with one Arlo Q is $19.99 a month and $29.99 for two. Nest Aware is $30 a month for one, and $45 for two at the same residence. Arlo Q for the win here. Nest Aware does have some great features that I could not compare to Arlo CVR, as I did not have the premium option. But on the surface, Arlo Q is significantly cheaper for a month of continuous recording. Arlo Q's plan states "50% off additional cameras" under the 2 camera option, so one can assume a third camera would be approximately $19.99 a month total for 14 days and $39.99 for 30 days.